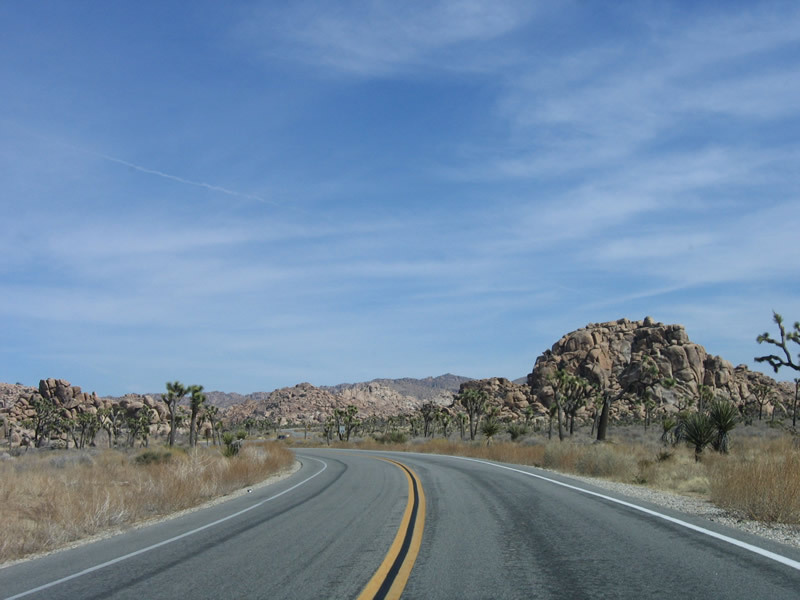 Christened a national park in 1994, Joshua Tree National Park is located at the convergence of the Mojave Desert to the north and the Sonoran (Colorado) Desert to the south. 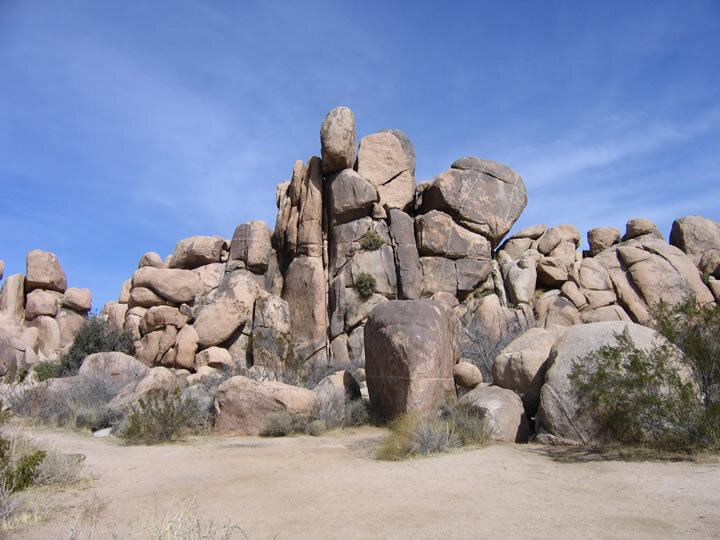 The unique Joshua Tree is the focal point of the park, as are the large piles of rocks that are scattered throughout the park. 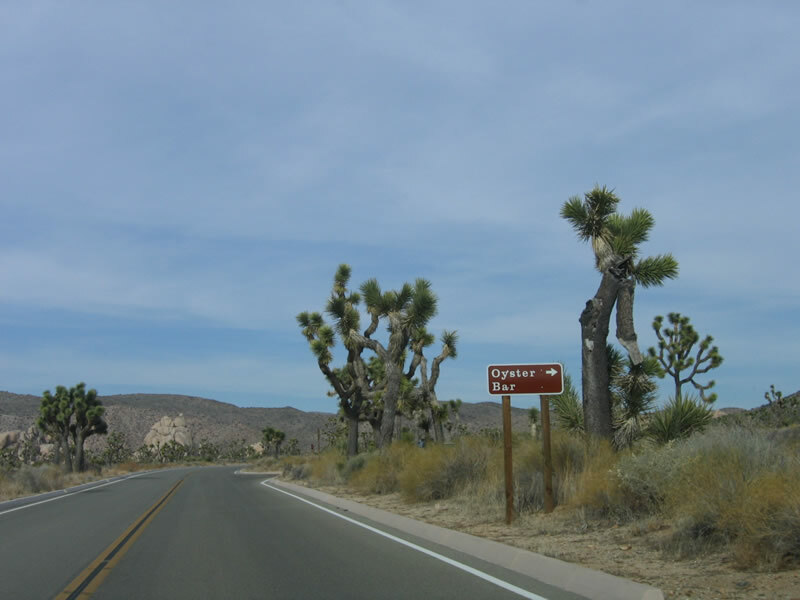 Joshua Trees are especially prolific in the Queen Valley and Lost Horse Valley within the park. 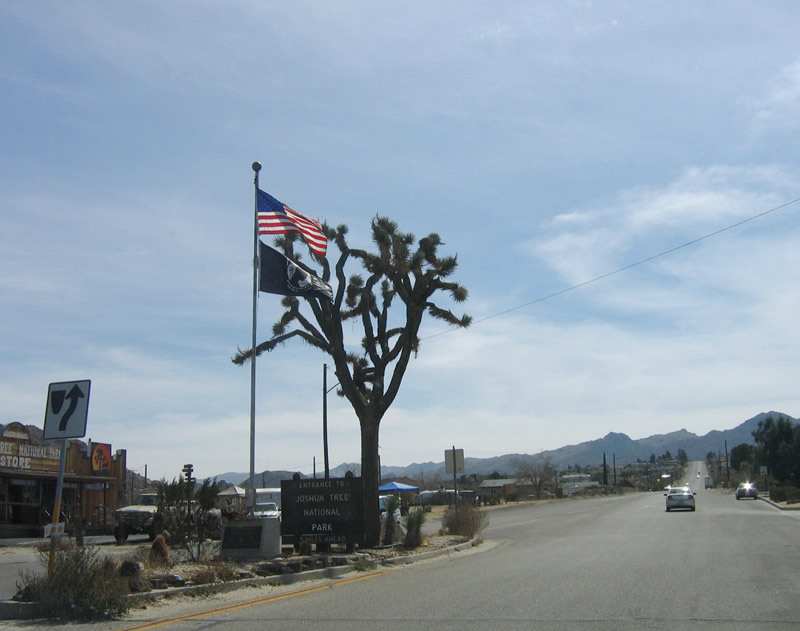 In Yucca Valley, Park Boulevard leaves California 62 en route to Joshua Tree National Park. 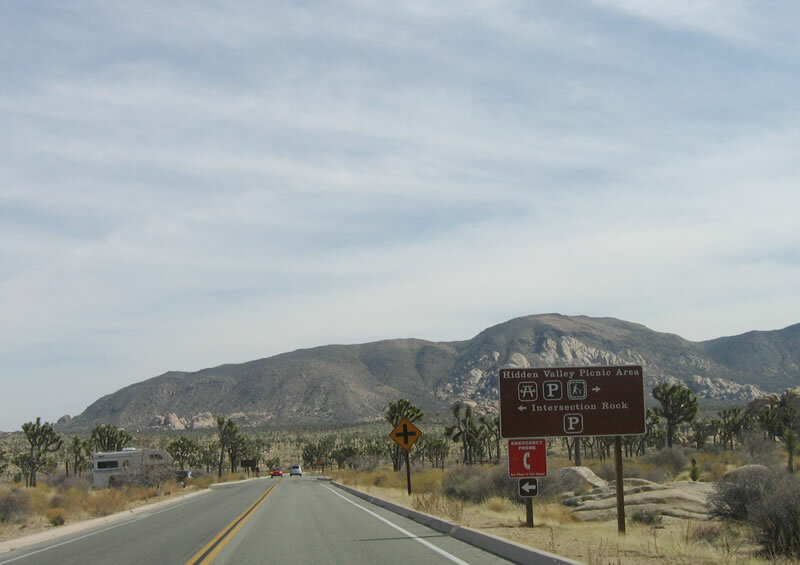 A welcome sign and median decoration points the way to the national park. Photo taken 02/26/06. Most of the route, known as Park Boulevard, is two lanes wide and undulates with the terrain. Photo taken 02/26/06. 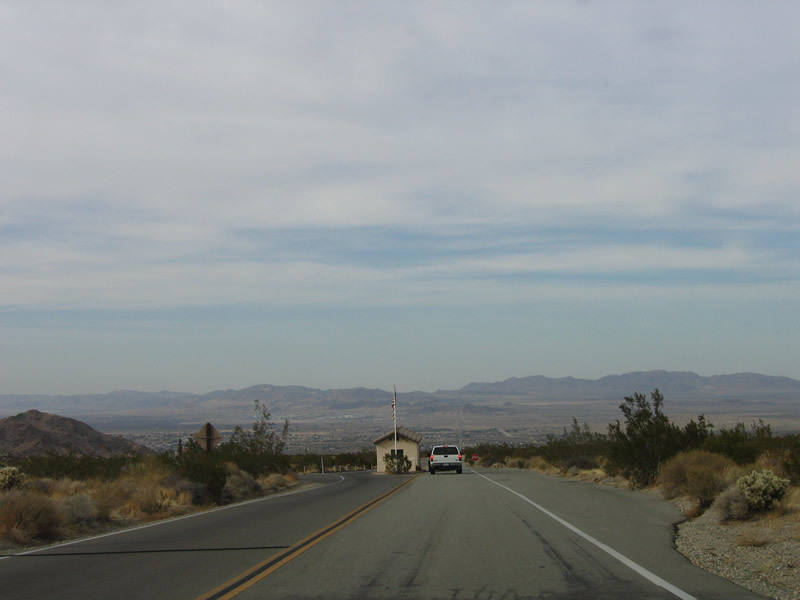 Still north of the main entrance to Joshua Tree National Park, Park Boulevard passes by several homes and ranches on its way to the park. Photo taken 02/26/06. Some sections of the route have sharp turns, such as this 30 mile per hour turn. Note that the shoulders are generally sandy and can be soft. Photo taken 02/26/06. 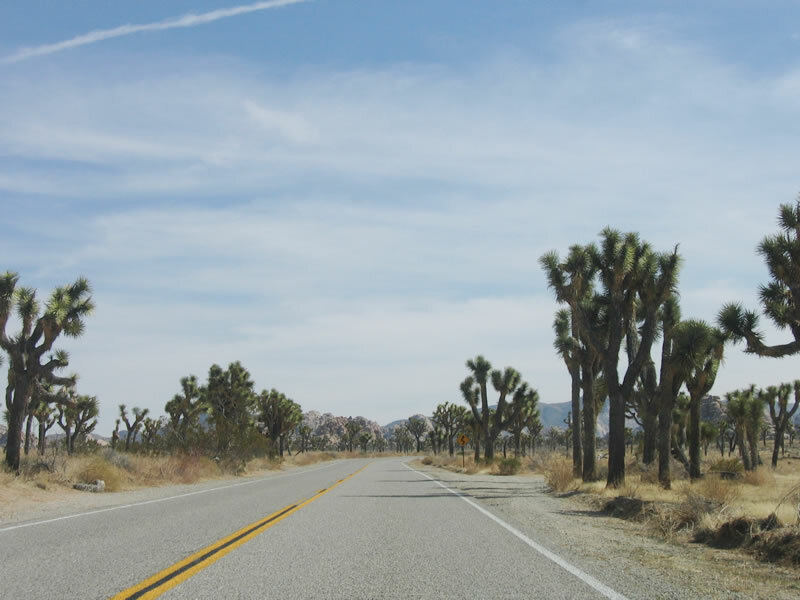 Joshua Trees, the plants for which the national park, begin to appear in greater numbers as the highway continues to ascend to higher elevations. 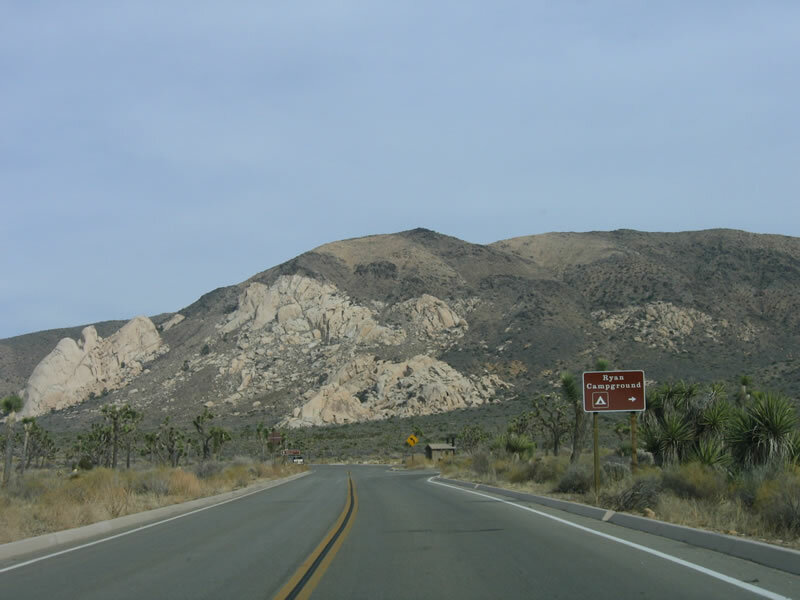 This elevation is crucial for the survival of the Joshua Tree, which depends upon the slightly cooler and moister Mojave Desert to survive. 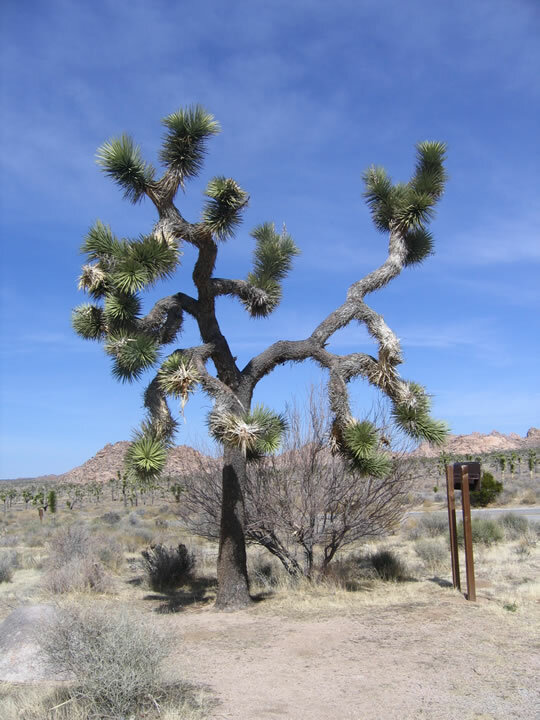 Joshua Trees do not thrive at lower elevations. Photo taken 02/26/06. 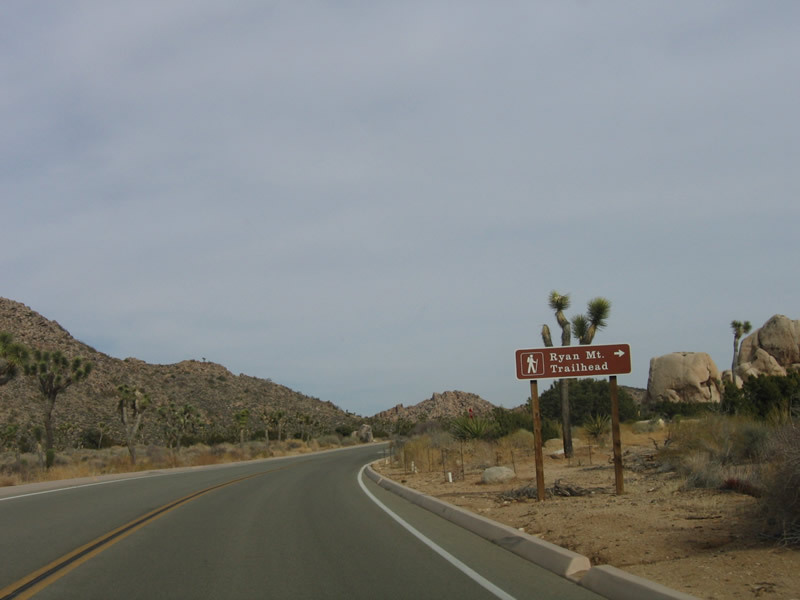 Park Boulevard enters Joshua Tree National Park. 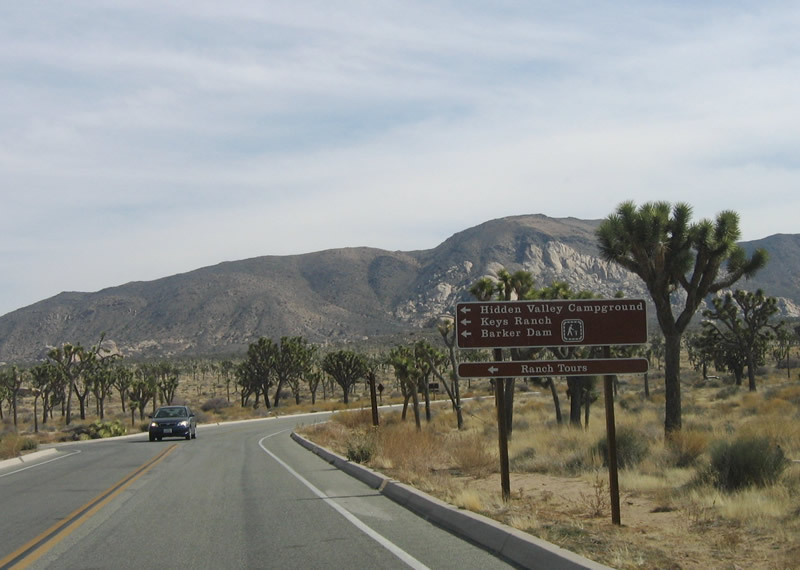 This area has been protected since 1936, when Joshua Tree National Monument was established. In 1994, the monument was upgraded to a national park, and more acreage was added to the park. Photo taken 02/26/06. A fee station blocks traffic ahead. 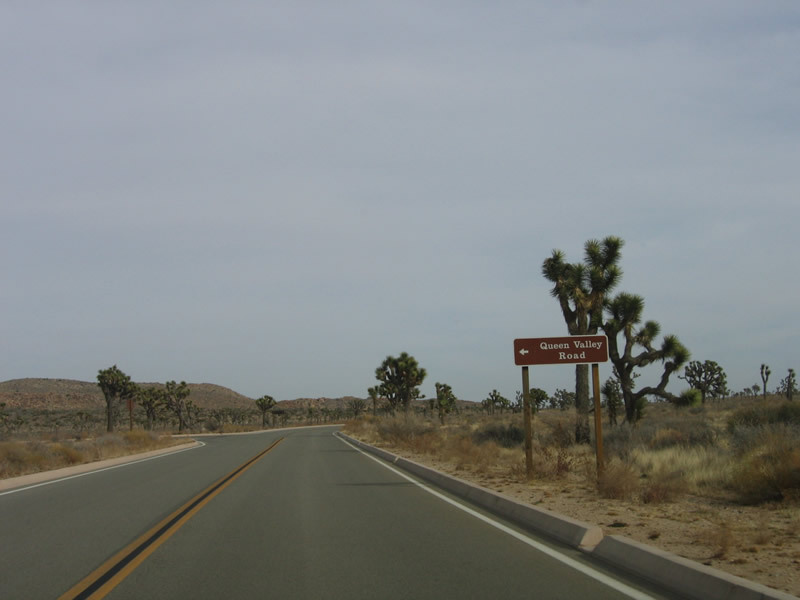 As of April 2006, the entrance fee was $15 per vehicle. Visit the official website for the latest fees. Photo taken 02/26/06. 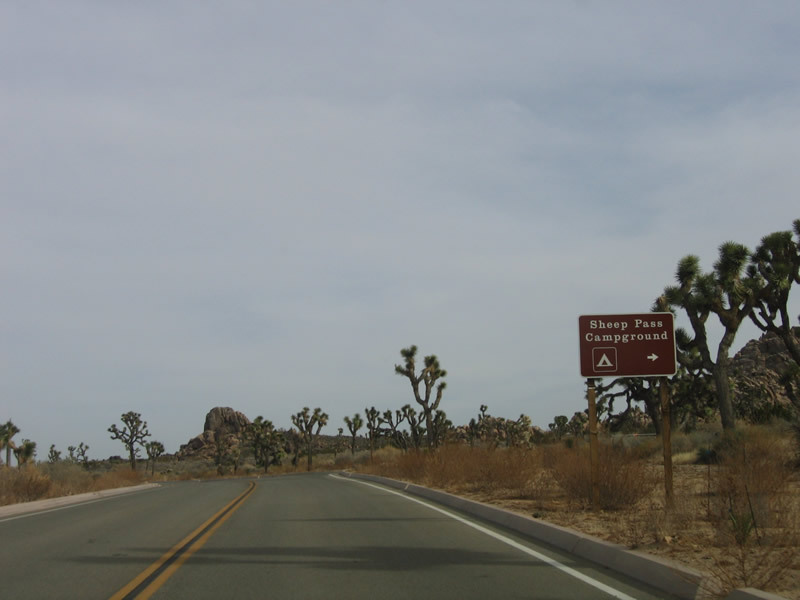 Joshua Trees immediately greet visitors as Park Boulevard continues to gain elevation within the national park. Photo taken 02/26/06. 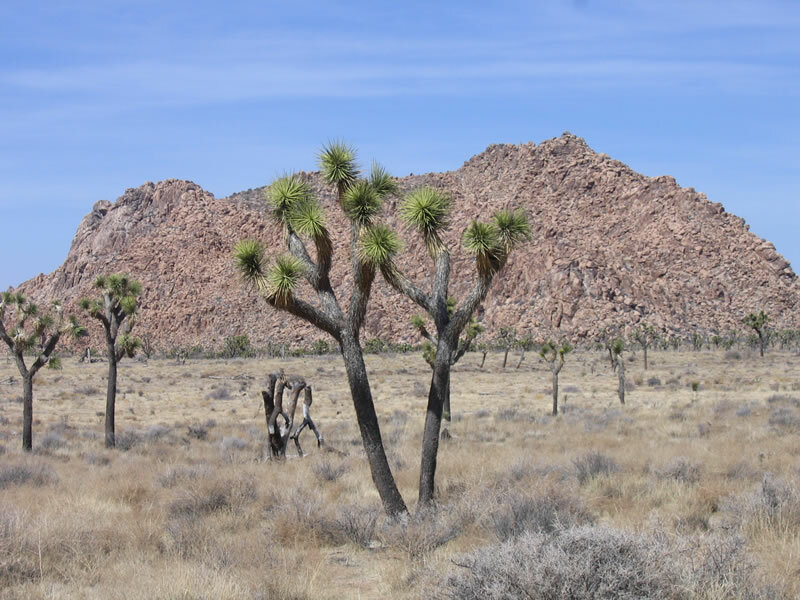 Some of the Joshua Trees are taller than their brethren, which gives a tantalizing sample of what is to come. Photo taken 02/26/06. 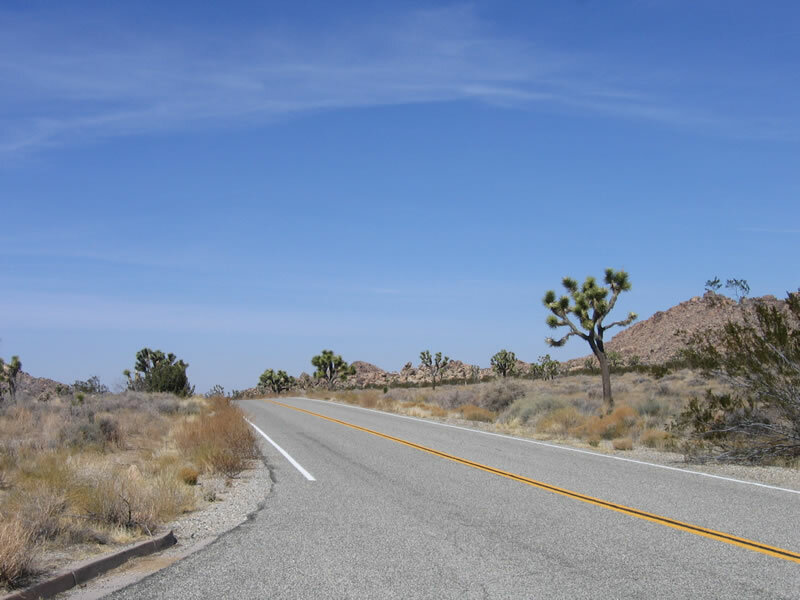 Pull outs and parking areas abound in Joshua Tree, which allows hikers and photographers the opportunity to see more areas of the park that would otherwise be seen through automobile glass. Hiking is encouraged here, but be sure to dress appropriately and bring plenty of water, especially in the hot summer months. Photo taken 02/26/06. Southeastbound Park Boulevard continues toward the central part of the national park. 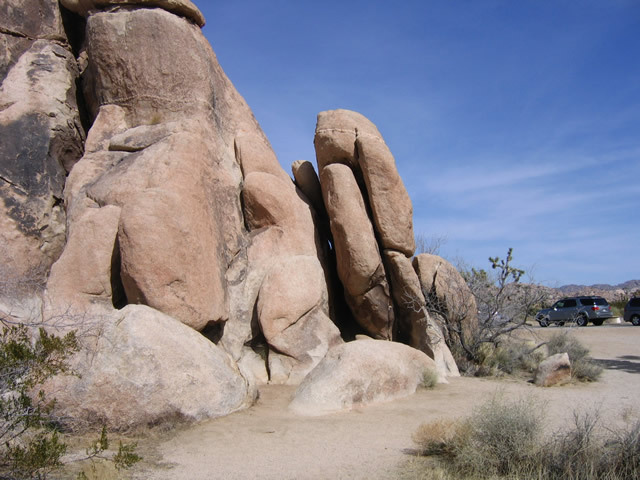 Rock formations abound here with the Joshua Trees, offering recreational opportunities for visiting climbers. Photo taken 02/26/06. 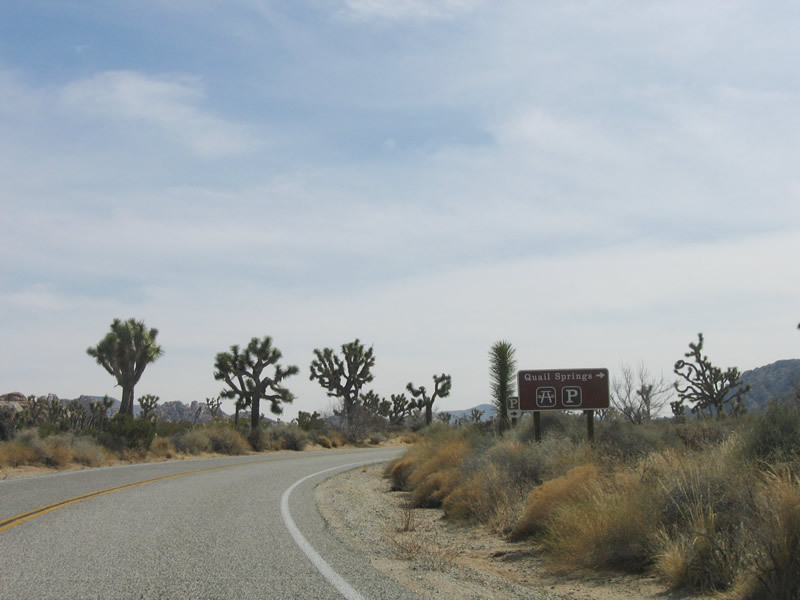 While Joshua Trees are dominant in this part of the national park, they are not found at the lower elevations in the park, especially in the eastern and southern sections. Here, they create a veritable forest. Photo taken 02/26/06. 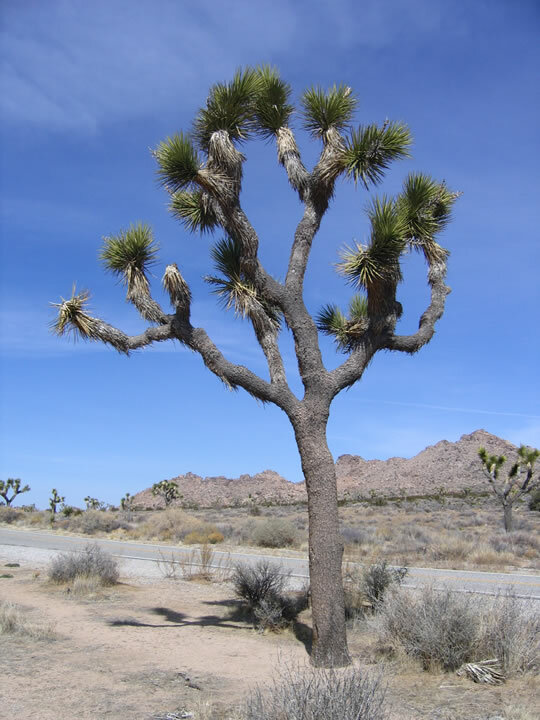 Joshua Trees, or Yucca brevifolia are only found in the southwestern desert states of Utah, Nevada, Arizona, and California. 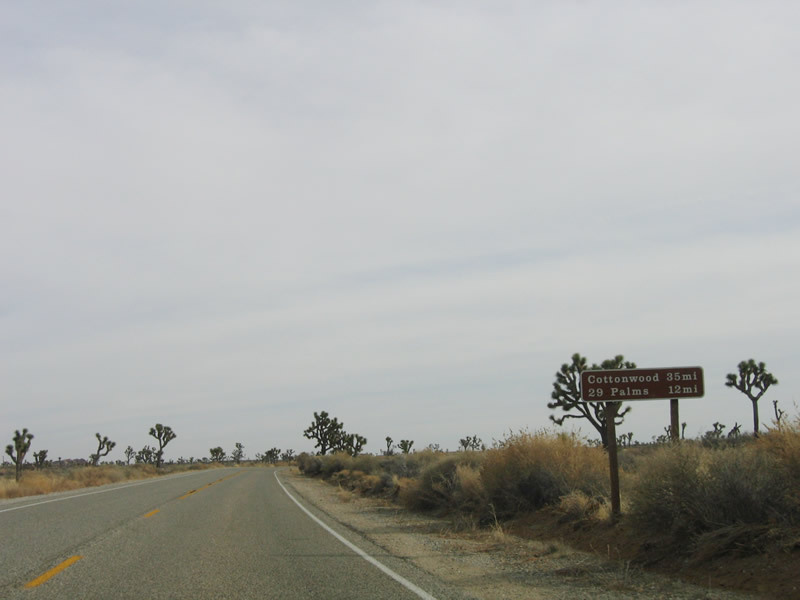 A similar stand of Joshua Trees is located along Nevada 164 west of Searchlight and east of Nipton in the northern Mojave Desert. Photo taken 02/26/06. Eastbound Park Boulevard approaches the turnout for Quail Springs. This area features picnicking, a hiking trail around the rock formation, and pit toilets. Photo taken 02/26/06. 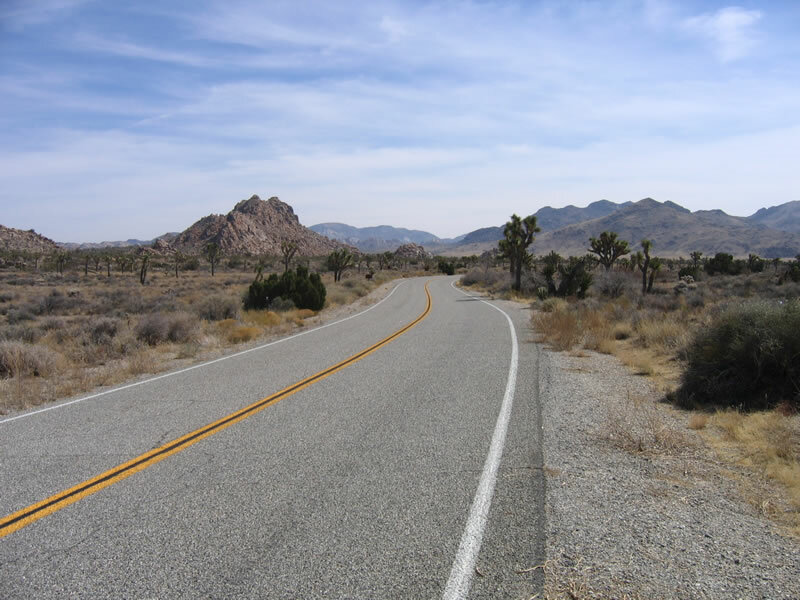 Continuing southeast, Park Boulevard (also known as Quail Springs Road) continues through the incredible Joshua Tree forest and enters Hidden Valley. Photo taken 02/26/06. The Boy Scout Trailhead is a parking area for those adventurous enough for a multiple day hike along one of the park&apos; longer trails. Photo taken 02/26/06. 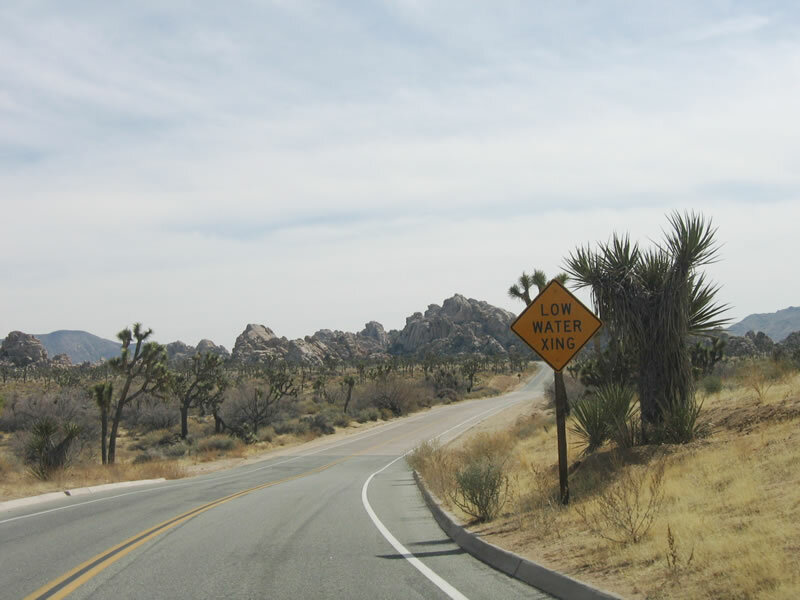 In the desert, low areas that drain from higher elevations are dry most of the year, but they can be places of fast moving water during rain events. Photo taken 02/26/06. A major intersection lies ahead. 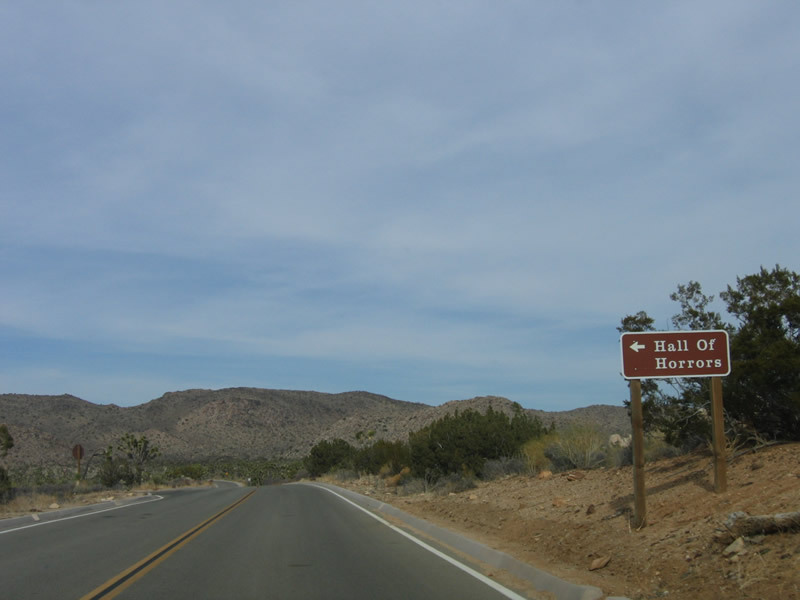 Turn left to Intersection Rock and right to Hidden Valley picnic area. Photo taken 02/26/06. 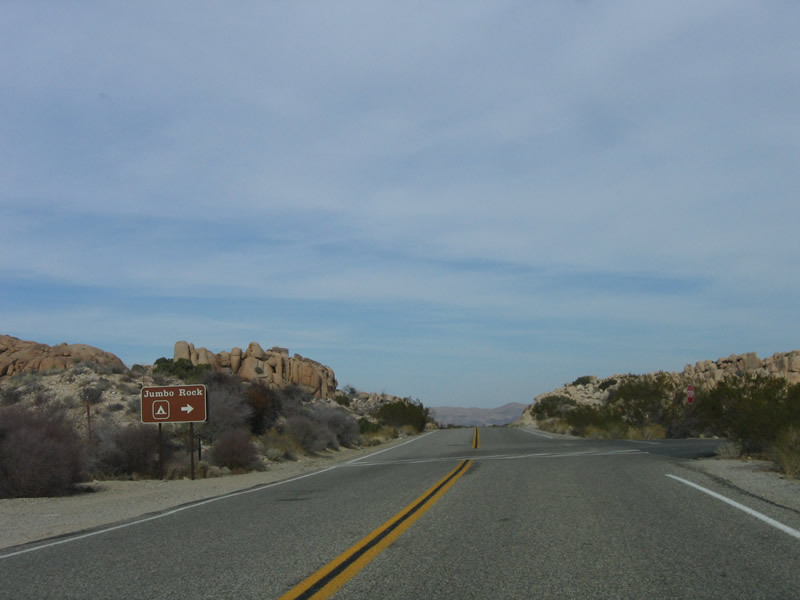 In addition to Intersection Rock, a left turn connects to Barker Dam, Keys Ranch, and Hidden Valley Campground. Photo taken 02/26/06. 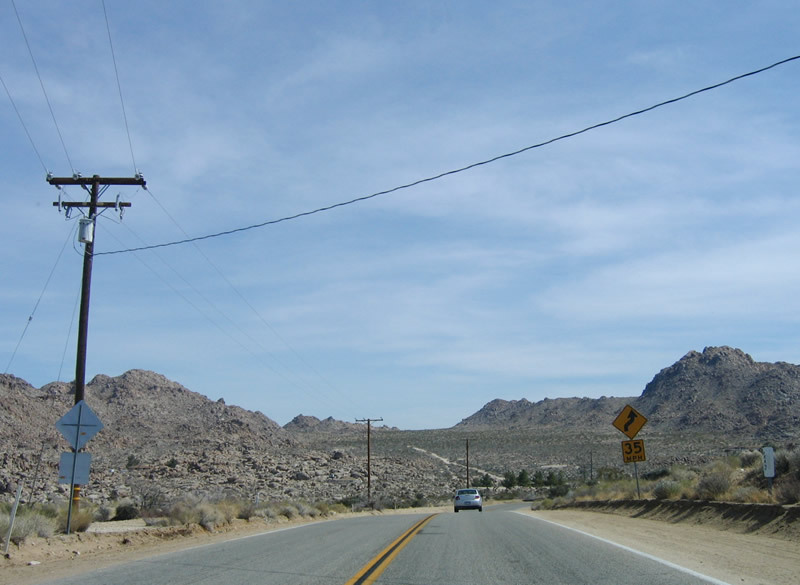 The next intersection connects the loop road with Ryan Campground. Photo taken 02/26/06. Most of the rock formations have unique names, such as Oyster Bar. Photo taken 02/26/06. The Hall of Horrors is another rock formation. Photo taken 02/26/06. The Ryan Mountain trailhead is the next parking area to the right of the loop road. Photo taken 02/26/06. 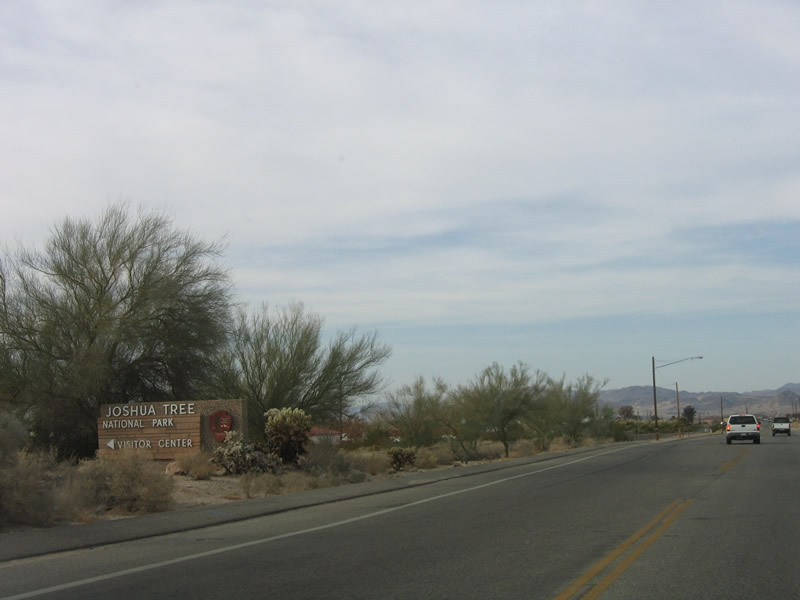 Another campground is located on the right after the Ryan Mountain trailhead: Sheep Pass Campground. Photo taken 02/26/06. 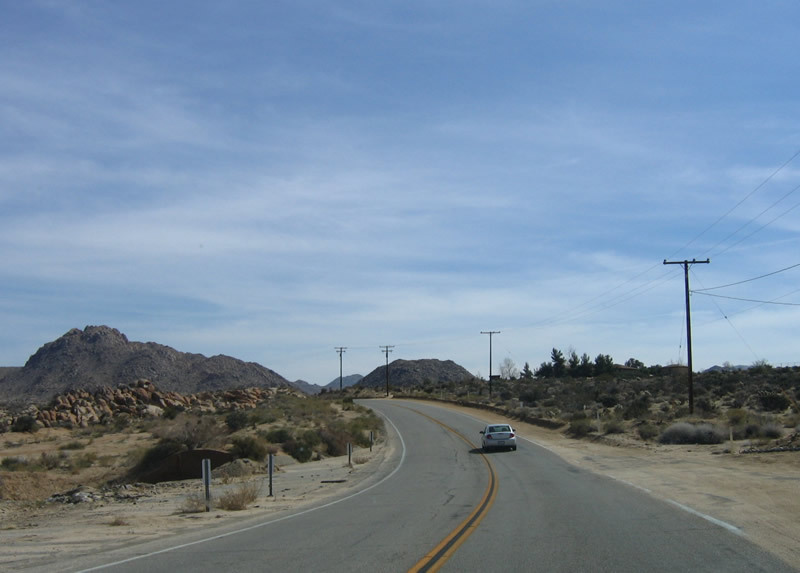 The next intersection is with Queen Pass Road, which travels northwest back toward Barker Dam and Hidden Valley. Photo taken 02/26/06. Continuing east, the loop road next encounters this intersection with Geology Tour Road and Desert Queen Mine . Photo taken 02/26/06. 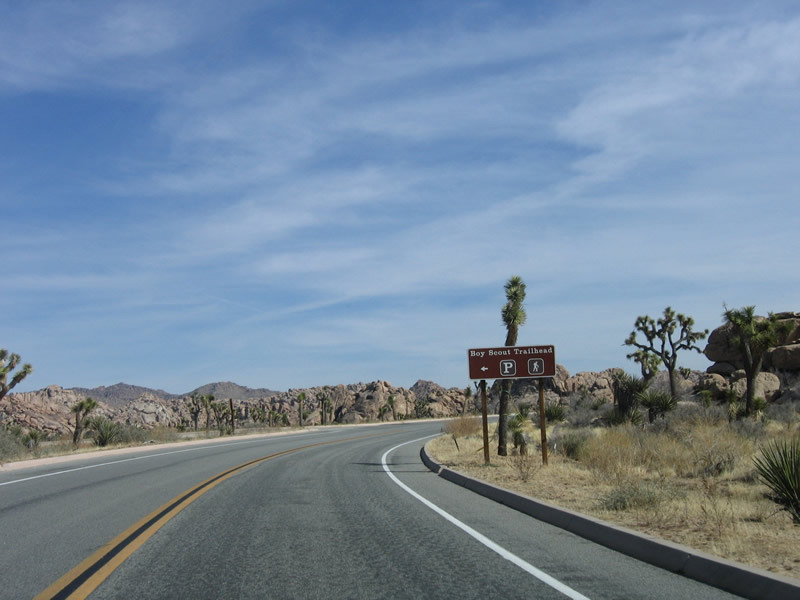 Now leaving the central part of Joshua Tree National Park, this mileage sign provides the distance to Cottonwood and 29 Palms. Photo taken 02/26/06. 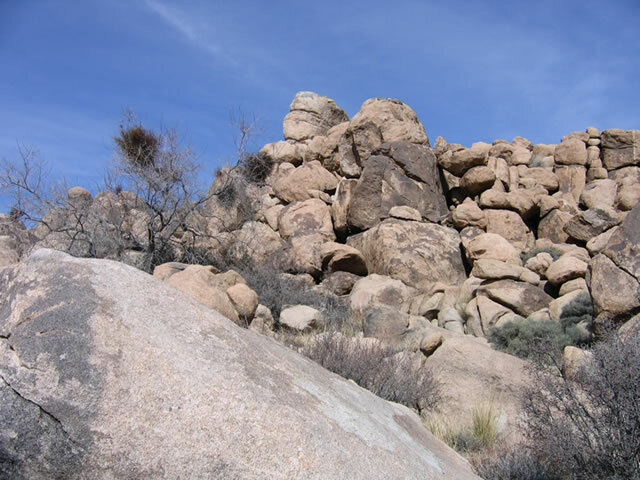 Jumbo Rock, another rock formation, lies on the south side of the loop road. Photo taken 02/26/06. 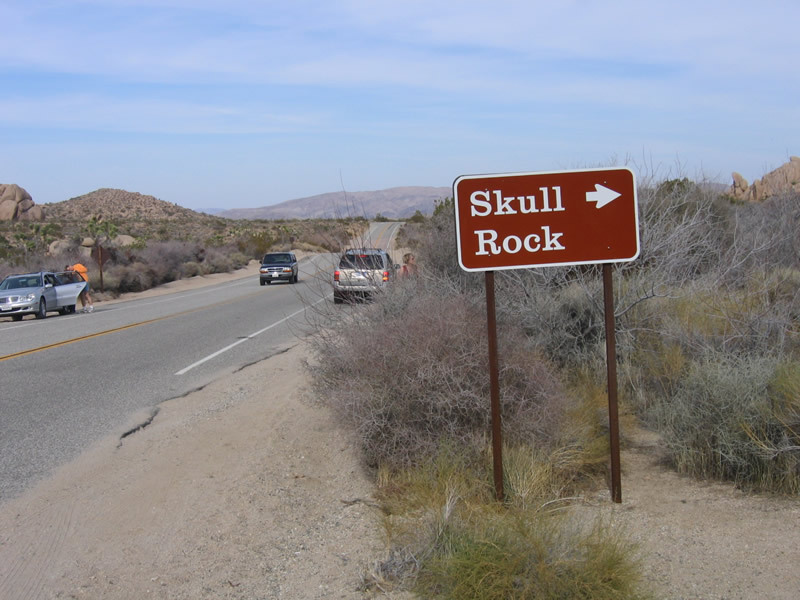 Another odd rock formation that is shaped like a human skull is the aptly named Skull Rock. Photo taken 02/26/06. 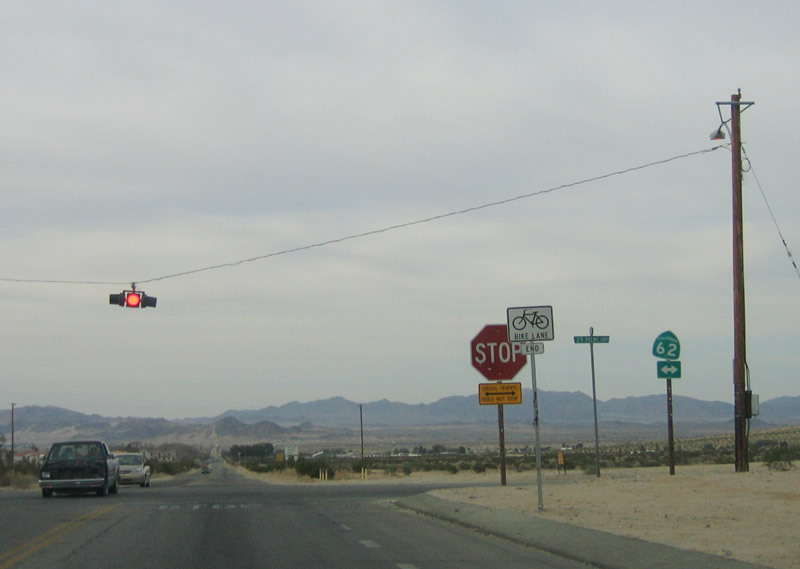 At this intersection, travelers have a choice: turn north to return to California 62 in 29 Palms or turn south along El Dorado Mine Road, Pinto Basin Road, and Cottonwood Springs Road back to Interstate 10 at Exit 168. There are no services between here and Interstate 10. Photo taken 02/26/06. The eastern portion of the Park Boulevard loop is not as dynamic as the western section. 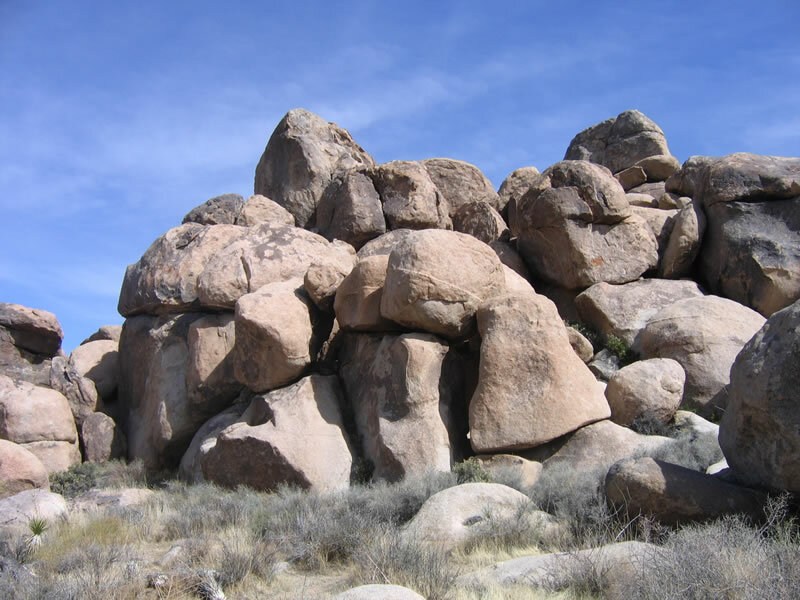 There are no curious rock formations or Joshua Tree forests. Photo taken 02/26/06. 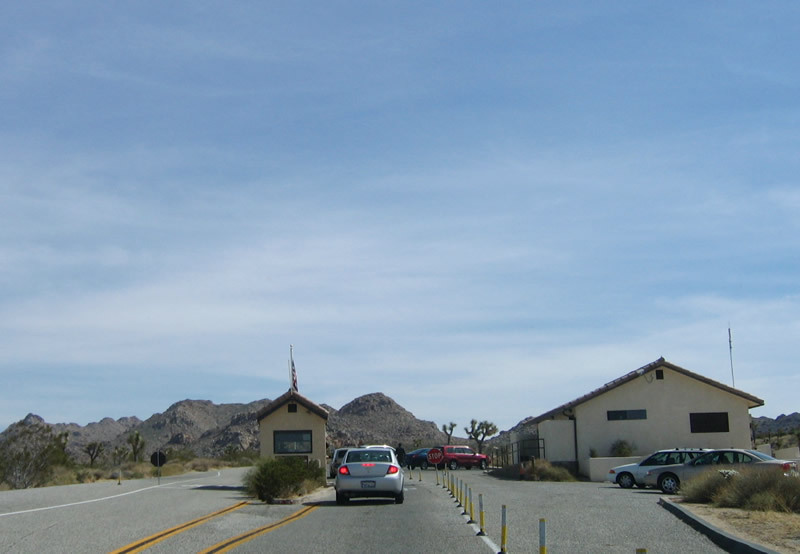 As Park Boulevard winds northeast into Twentynine Palms, the park road passes by this fee station, then exits Joshua Tree National Park. Photo taken 02/26/06. After leaving the national park and entering the city of Twentynine Palms ("An Oasis of Murals"), Park Boulevard changes into Utah Trail. Photo taken 02/26/06. 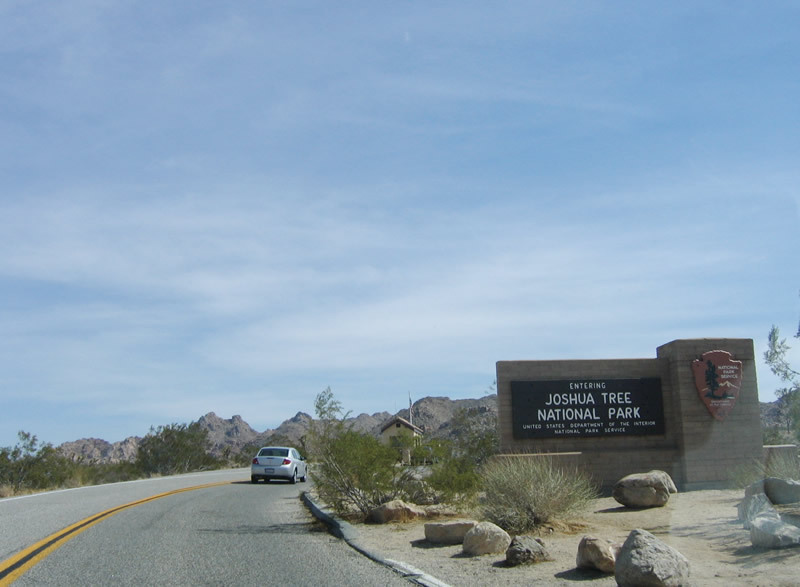 The Joshua Tree National Park administration and visitors center is not located within the main park, but rather is located in Twentynine Palms on the west side of Utah Trail (Park Boulevard) as the highway approaches California 62. Photo taken 02/26/06. 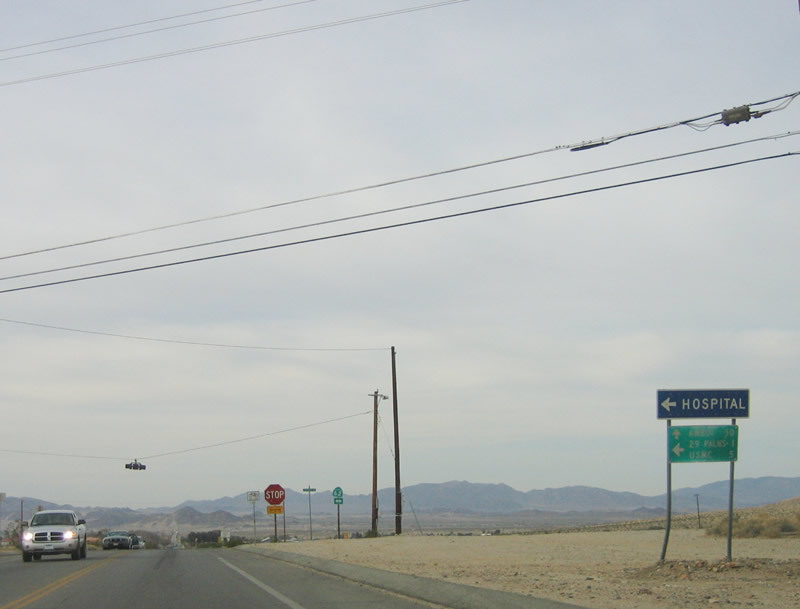 Northbound Utah Trail reaches its junction with California 62 just east of downtown 29 Palms. 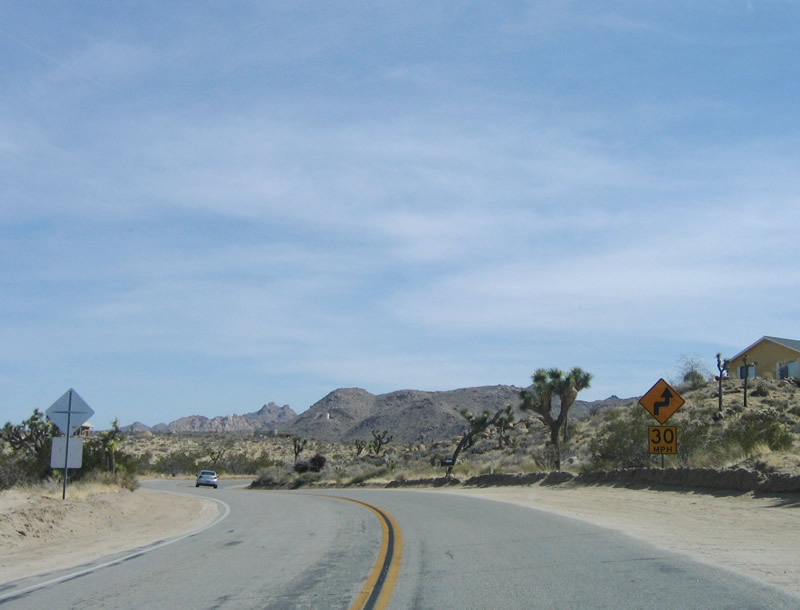 If you intend to drive east on California 62, there are no services. 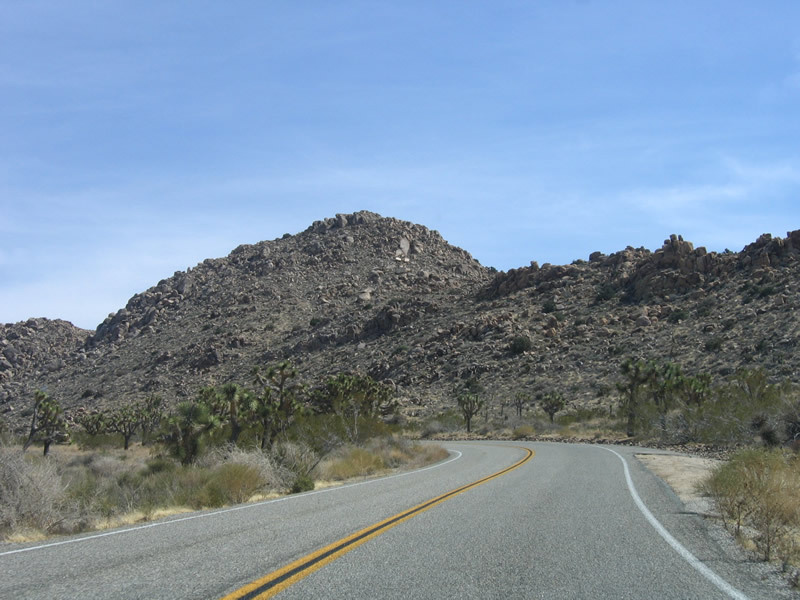 It would be wise to drive west to 29 Palms, fill up the tank, and then continue east toward California 177, Rice, and Vidal Junction. Photo taken 02/26/06. 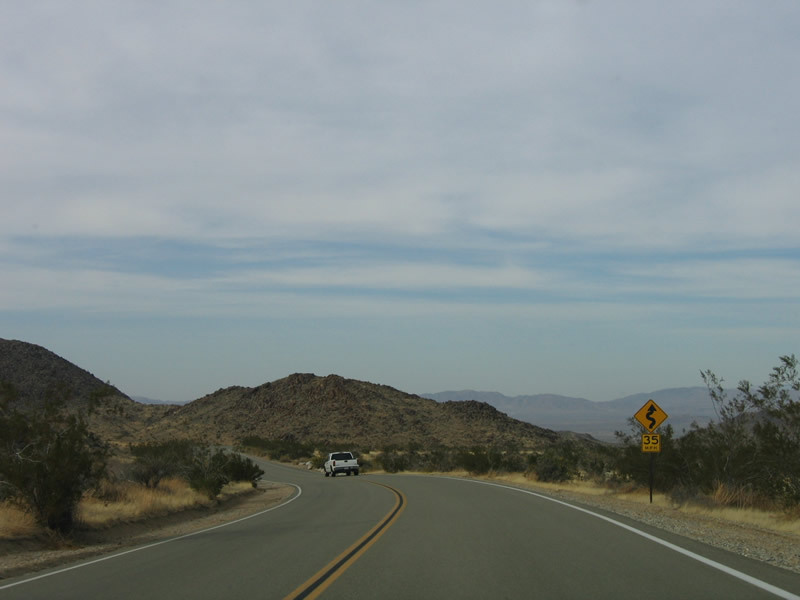 Looking northwest from Quail Springs is this view of the loop road, partially hidden by the undulating landscape and the dense collection of Joshua Trees. Photo taken 02/26/06. 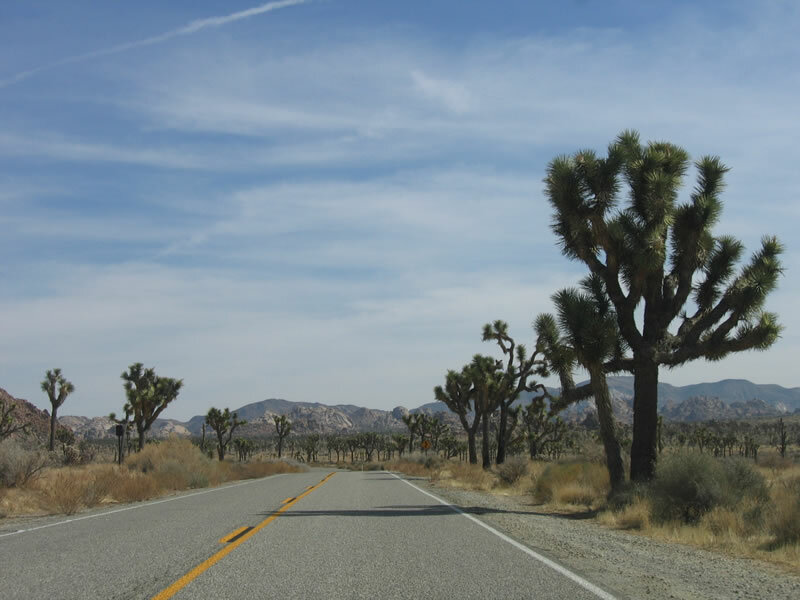 Joshua Trees usually live for a hundred years or more, but it is hard to determine their age because there are no tree rings. 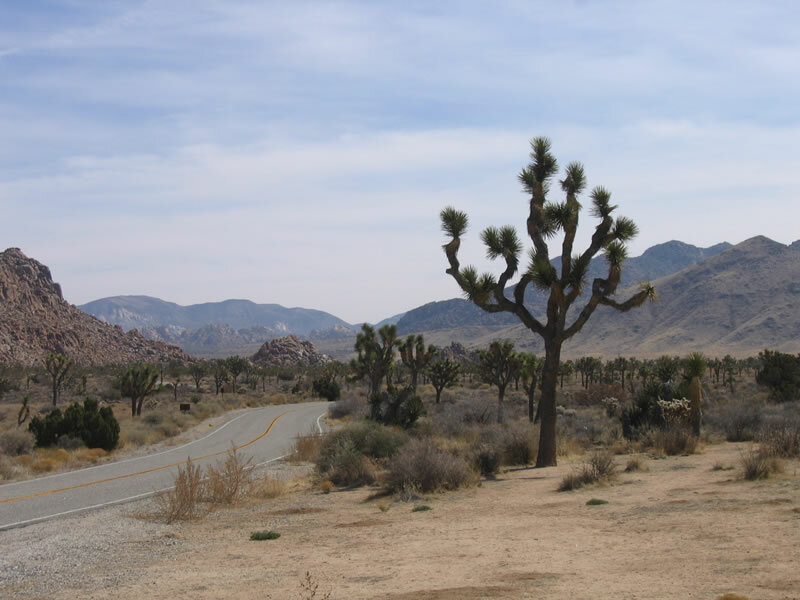 Technically, Joshua Trees are not trees at all, but rather are monocots and are members of the lily family. 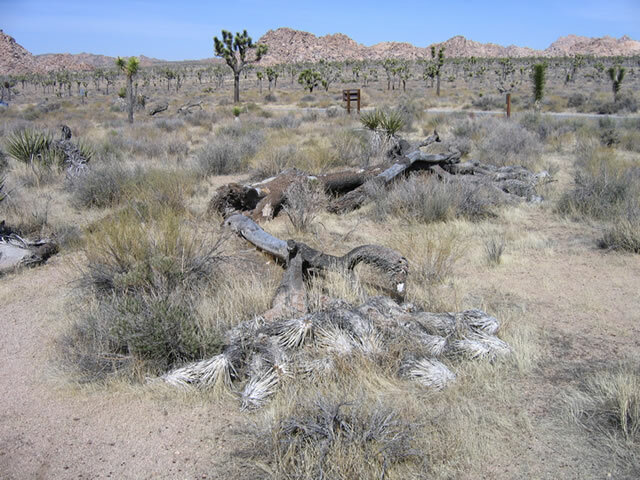 Since they have very shallow roots, Joshua Trees can be prone to tumbling over when they get top heavy or start to splinter. 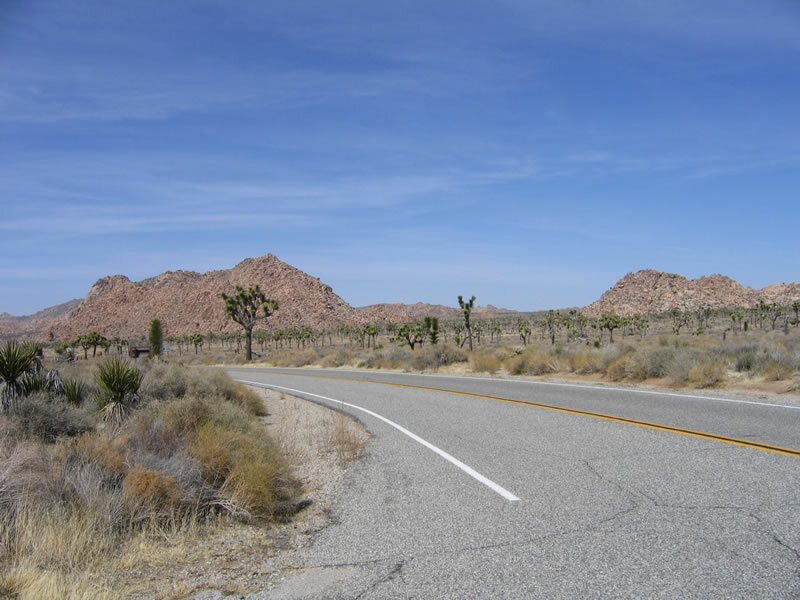 Growth of a Joshua Tree is very slow, with less than an inch in new growth for the average Joshua Tree. Photo taken 02/26/06. 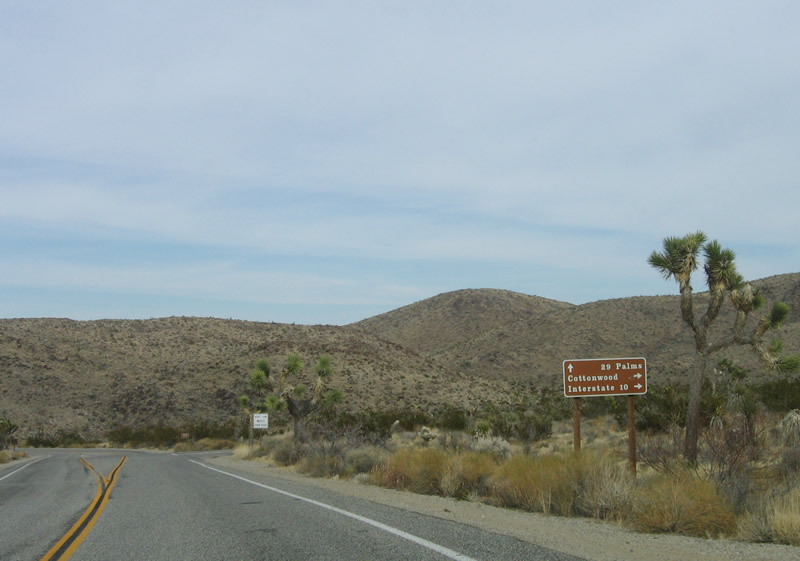 The smaller Mojave yucca is also very common in Joshua Tree National Park. 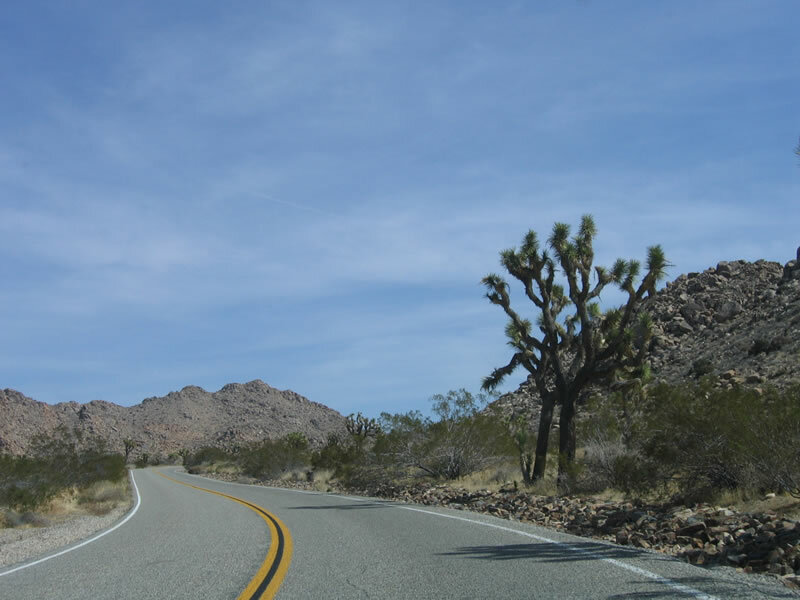 Even though it is not a big as the Joshua Trees, they can be just as common, and they are generally located in the same environment as the Joshua Trees. Photo taken 02/26/06. 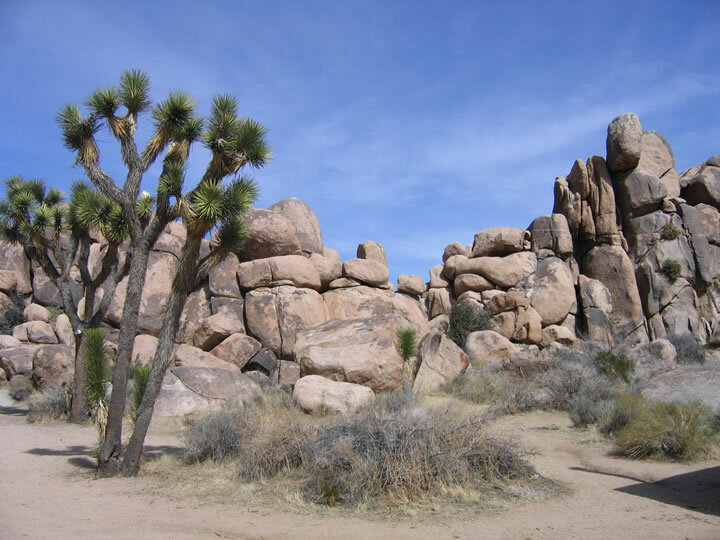 According to the National Park Service webpage, the name of "Joshua Tree" derives from Mormon pioneers who named the tree after the biblical figure Joshua. Supposedly the Mormons viewed the outstretched limbs of the tree as if they were arms pointing the way westward. Photo taken 02/26/06. 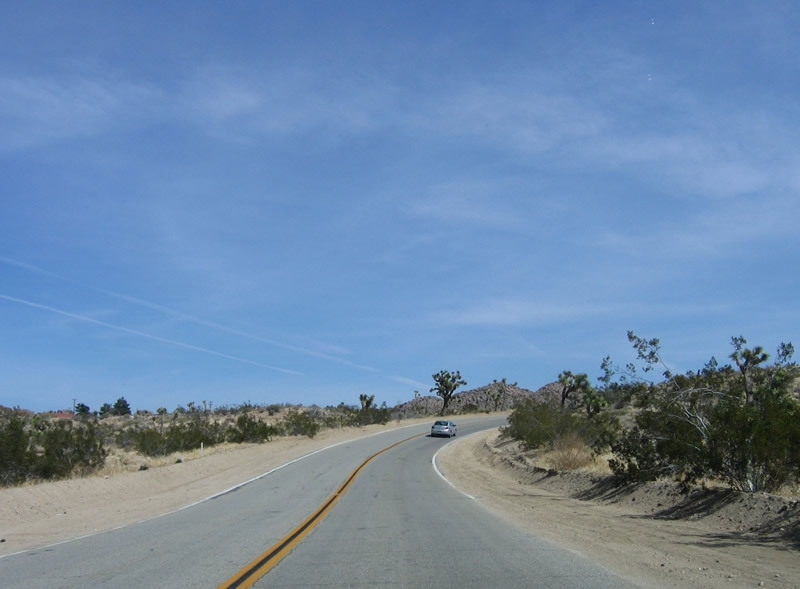 Now leaving Quail Springs, the loop road continues northwest toward the town of Joshua Tree and California 62. Photo taken 02/26/06. 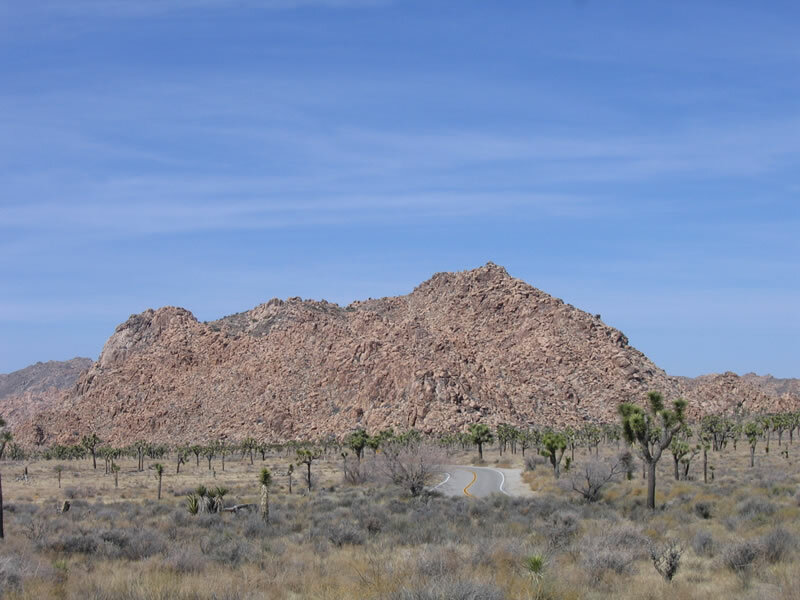 At the Quail Springs Parking Area, a large rock pile is surrounded by groups of Joshua Trees. This photo was taken from the dirt trail that encircles the rock pile. Photos taken 02/26/06. Page Updated April 14, 2006.